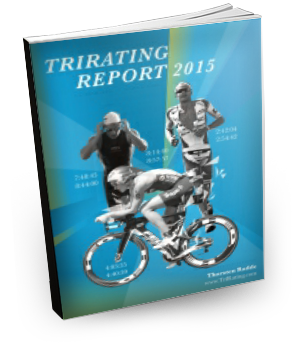 I’ve been busy working on my free TriRating Report 2015, more than 60 pages filled with results, data, and analysis about the 2015 season. This year I’ll be designating female and male “Athletes of the Year”, “Rookie of the Year” and “Comeback of the Year”. Of course the report also contains my Top 10 Ratings (overall and individually for swim, bike and run), the fastest 2015 times and best performances, 2015 Money Lists and a look forward to the 2016 Racing Season and to Kona 2016.
Who had the fastest Ironman-distance times of 2015? Who posted the fastest marathon times in an Ironman in 2015? Who are the three Canadian athletes that won a Pro Ironman in 2015? Who had the slowest swim when winning an IM in 2015? Who overcame the biggest deficit after the bike to win an IM in 2015? Which athletes won two or more Ironman-distance races in 2015? Who are the last Pro podium finishers in Kona from the US? Which athletes won a 2015 race on a race on another continent than they are from? Three North American athletes that won a race in Europe? Three European athletes that won a race in North America (excluding Kona)? Which four athletes won a 2015 Ironman-distance race with the best times in all three legs? Which IM-distance races in 2015 had the closest margin between the winner and runner-up (Pros only)? I’m sure that you’ll like what I’ve put together, so order today to re-live the 2015 season and get fired up for the upcoming 2016 races! The report is available for free, but if you want to you can show your support of my work by donating an amount of your choice. As always, thank you for your feedback and support!